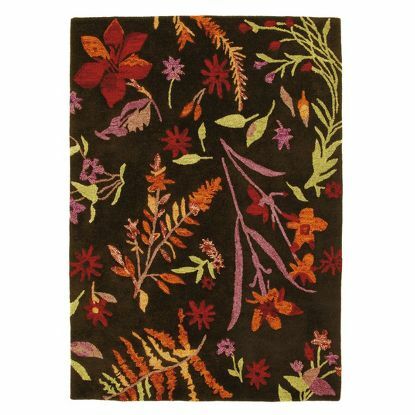 Ferns and flowers, silhouetted like pressed specimens or botanical illustrations, come to life against a dark brown ground. The flowers are hooked in a variety of yarns, including textured, tie-dyed and mottled yarns, giving them tactile richness. This stunning rug’s background is made from natural, undyed wool, so its color will have slight variations. 100% wool; hand-tufted.